Book is available at www.fredaprim.com, www.amazon.com, and www.barnesandnoble.com. From one side, history curriculum taught in the Middle East's public schools is manipulated and it focuses predominantly on the region's Islamic era. Such curriculum is grossly altered and rewritten to suit a meticulously planned ‘Arabization,’ ‘Turkicization,’ and more recently Kurdification process of the Assyrians. From the other side, some historians question the continuation of ancient Assyrian civilization and people. 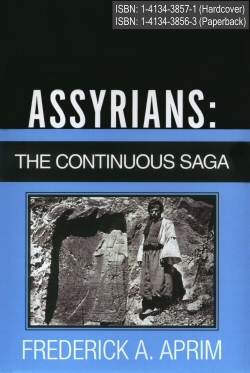 Furthermore, certain Old Testament nonfavorite images of Assyrians are dominant in literature. Thus, unbiased publications and historical references regarding the survival of Assyrians since the fall of their Imperial capital Nineveh are of great importance.